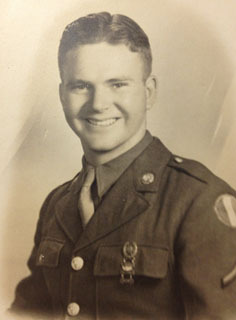 When Sean Guess brought his grandfather, Harrison Wright, to a mobile booth in Austin, he asked about Harrison’s service during World War II. Harrison was drafted in early 1943 and soon after shipped out to Europe. He played the bugle in his unit, and, at the end of the war, he was called upon for a special assignment. Originally aired May 25, 2012, on NPR’s Morning Edition. Photo: Army Sgt. Harrison Wright as an 18 year-old. Photo courtesy of Harrison Wright. Harrison Wright (HW): I was an 18 year-old boy and I was drafted. Went from England, France, Belgium, Germany…and uh, I blew the bugle, in our outfit. If a young man is killed in action or dies defending his country, you blow ”Taps” over his grave. And it just…there’s no way to describe it. The emotion that you feel, knowing that those notes is going out. And I remember, the war was over, just a few days…and they asked me to blow ”Taps” for all who died in the war. We climbed this high hill. It was like a mountaintop. And my battalion was at the bottom. I blew those ”Taps” and, when I did…the men said it…floated out across all that valley. And said it was beautiful. They were all telling me how good it sounded and what a tribute it was, to our fallen comrades.